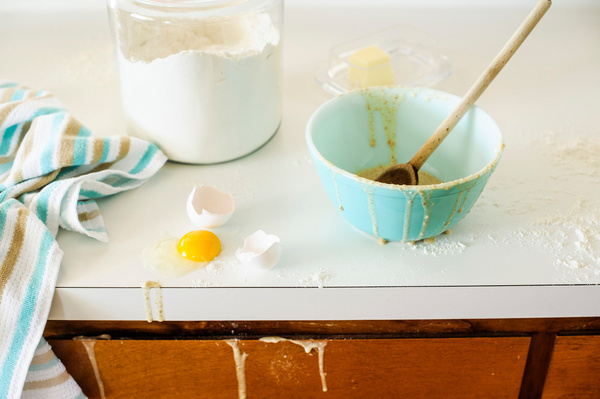 Here are my tips for dealing with the colossal mess that comes with cooking and baking for a crowd. Trust me on this one people. I just made 200 pink marshmallows. It doesn’t get much messier than that! Start with a clean slate. Put away the clean dishes, wipe down the counters and empty the sink before you begin. Starting clean makes it easier to find things, and to have ample room for the task at hand. Take out all of your ingredients. Rummaging through the cupboards with sticky hands is not the way to go. Suddenly, everything is sticky and will require you to wipe down things you wouldn’t normally have to. It also helps make sure that you have everything you need before you get started. Wash the dishes as you go. When you are done with something, put it right into the sink to soak. Once you finish that part of the project, wash them or put them into the dishwasher. Don’t leave the mixing bowls from the cake in the sink, only to find you don’t have room to wash the lettuce for salad. It will also help you keep tabs on where things are. If you need to reuse a bowl or utensil for something else, it will be clean and ready for you. Keep up with the wiping up! If something spills, wipe it up as soon as you can. Not only will it keep your workspace tidy, it will avoid cross contamination of foods. It is also easier to wipe up something fresh, than to try to clean it up later when it becomes dry and crusted onto things. Been there. Done that. Not fun. For me, cooking and baking should be a calm experience. When all hell breaks loose in the kitchen, it takes the joy out of the process. It almost always shows in the end result too. Do your self a favor, and clean as you go. Its worth it!! This entry was posted on January 12, 2016 at 7:52 am and is filed under Food. You can follow any responses to this entry through the RSS 2.0 feed. You can leave a response, or trackback from your own site.